I had been reading about all of the benefits of probiotics so I wanted to eat more fermented foods. 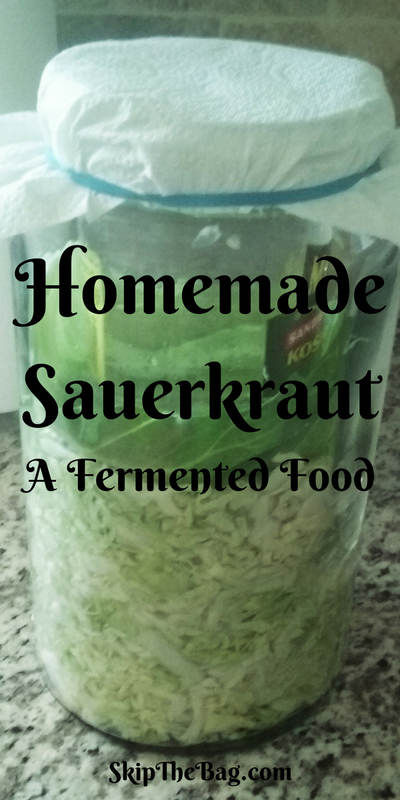 One easy fermented food is sauerkraut. Sauerkraut is a traditionally German food and is essentially fermented cabbage. My favorite ways to eat it is on a Ruben sandwich or served alongside bratwurst. I first went to Publix to see what sauerkraut options they had, but their sauerkraut is all in glass jars, which makes me nervous that they are no longer living and fermenting. Live sauerkraut will continually produce some carbon dioxide and if enclosed in a glass container the pressure may increase so it would explode. So the fact it packaged this way leads me to believe that it has been pasteurized. Next I went to The Fresh Market where they have some that are in a plastic bag (I know…) with a vent and stored in the refrigerator. 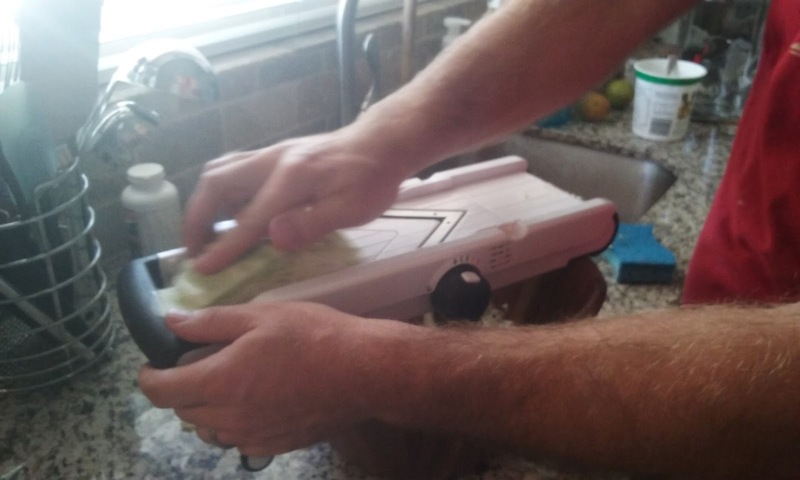 The vent allows any excess carbon dioxide that is produced to escape out of the bag and the refrigeration slows the bacteria down so it doesn't produce quite as much carbon dioxide. 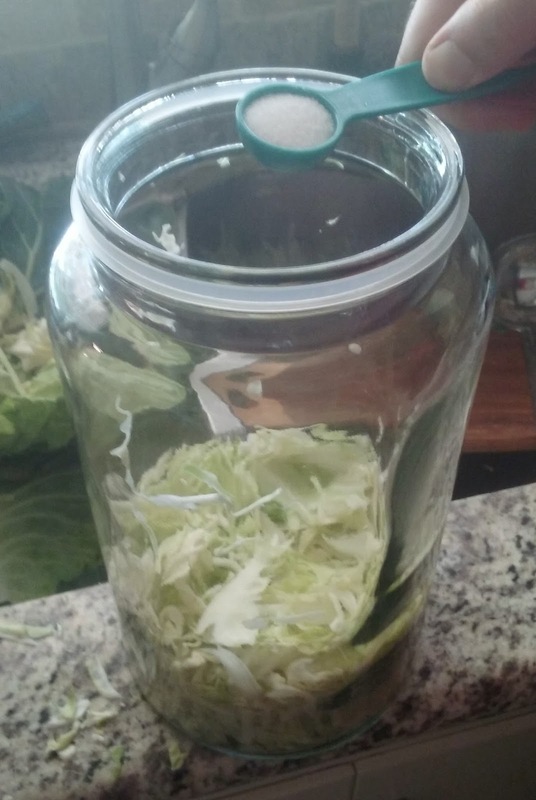 I saw online how easy it was to make so I went to the store and purchased a large glass container, and a head of cabbage. First you remove the outer leaves of the cabbage and cut it up into sections. Cabbage from the local farmer's market. Then you want to either slice up the cabbage or shred it. The first time we made sauerkraut hubby used a knife, but we used the mandolin this time and he said it was much easier (I LOVE my mandolin*). After shredding the cabbage you 'bruise' the cabbage. This helps break down the cellulose and helps it to release water. We used a a ladle, but later switched to a potato masher and I think it worked a little better. Finally you want to add salt. The salt does two things. 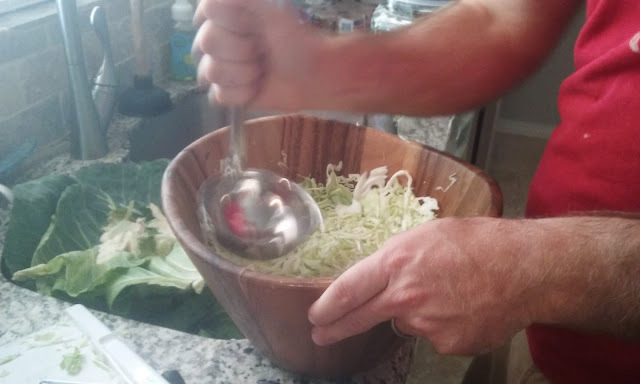 First it helps draw out the moisture from the cabbage to create the liquid the sauerkraut will ferment in. Then it also makes an environment that inhibits growth of other organisms. We ended up putting about a tablespoons in ours. Finally we placed one of the outer leaves of the cabbage to serve as a barrier between the kraut and the air. Ideally all the kraut will be in liquid brine and not exposed to air. The exposure to air can allow for the growth of unwanted bacteria and yeast. 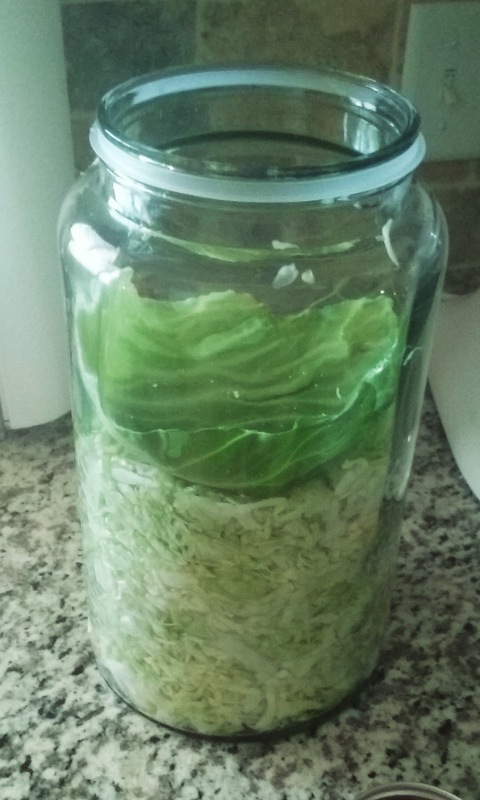 If after about 24 hours your cabbage does not release enough water to completely cover the kraut you will need to add some more brine (saltwater). Both times we've made sauerkraut we've had to do this. 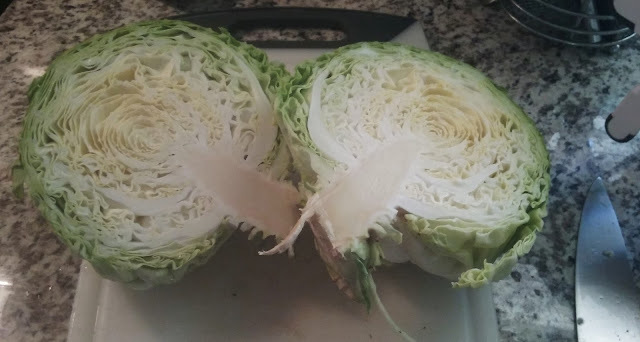 It may partially be because we are not bruising the cabbage enough, or not adding enough salt, or the cabbage was just a little dehydrated when we got it. It's nothing to stress about. The added brine should be roughly 1 t.ablespoon of salt per 2 cups of water. To further compress the kraut down we put an old pickle jar filled with water on the cabbage leaf and then covered the whole thing with a paper towel. The goal is to prevent items from falling into the kraut and contaminating it while still allowing carbon dioxide to escape. Within a day or so it will start to bubble and ferment. In about 2 weeks it started to taste like sauerkraut. After about a month or 6 weeks we moved it to the refrigerator. The outer cabbage leaf barrier we used only lasted about a week. 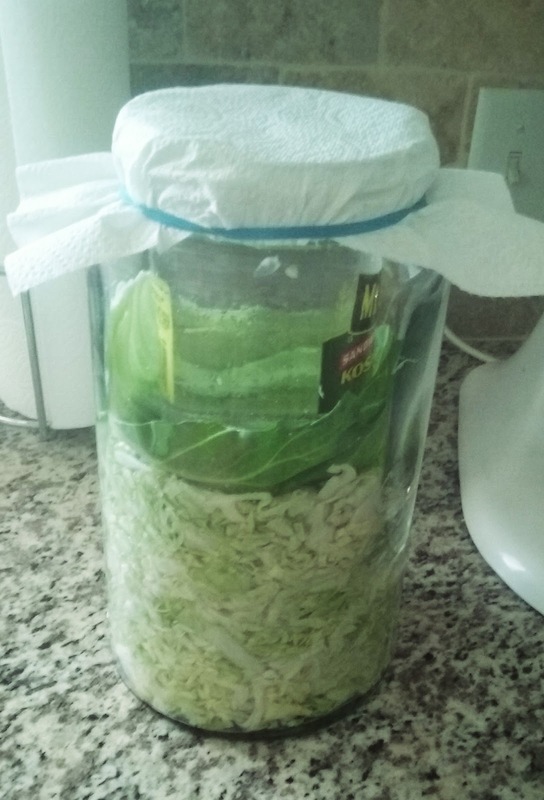 When it starts growing things you will need to replace with either another leaf or regularly compress the kraut to ensure it is under the liquid at all times. Again a potato masher can help. We didn't add any spices, but you can. I just recently heard about a dill kraut and caraway is always a popular addition. Other things we'd like to try and ferment are pickles and kimchee. Have you fermented anything? *This post contains affiliate links. See disclosures. It's really not hard and it's very tasty! If you start now it could be ready for St. Patrick's Day! 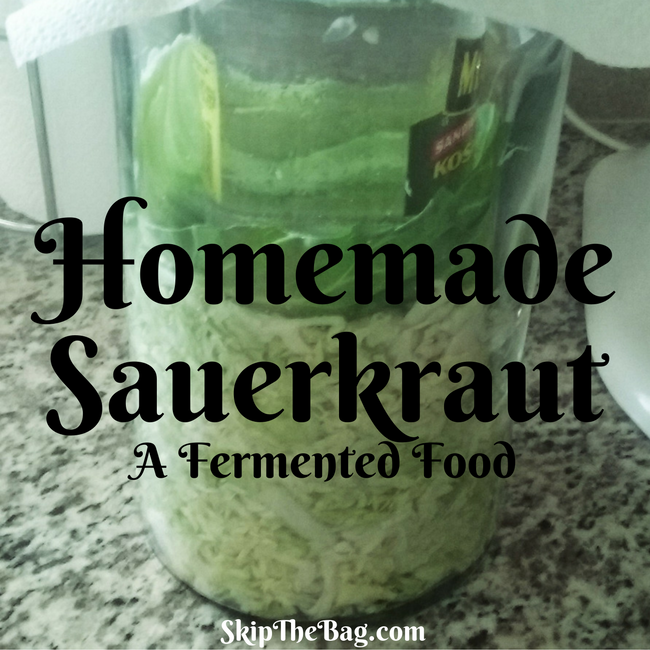 I grew up making sauerkraut with my German grandmother. I have fond memories of us taking turns stomping the kraut, and I remember how shocked my friends were that I loved it! Thanks for sharing at The Pretty Pintastic Party! It is fascinating how by stomping it well, you don't need to add additional brine. It is tasty! It's so simple. We've enjoyed making it. Yes, it's very easy and since it is fermented, lasts a while in the refrigerator.